I don’t know if GS means “guaranteed satisfaction” on this particular sedan offered by Lexus, but it would be OK with me. That’s what the buyer gets with a car like this, which is the model I drove this past week. It’s called a GS450h, and the “h“ stands for hybrid drive train, made up of a 286 horsepower V-6 and two electric motor/generators. Total horsepower of the gasoline/electric package is 338, and the power is delivered through a continuously variable automatic transmission. Although not officially designated a “sports sedan”, this 4,150 lb. car can go from zero to 60 mph in under 6 seconds. Top speed is reportedly a governor-limited 136 mph. The Lexus GS series of cars has been around since 1993, and is now in its fourth generation configuration for 2013. Lexus, headquartered in Nagoya, Japan, is the luxury brand of Toyota Motor Company, and the first Lexus to hit our shores was the big LS series in 1989. The company currently manufactures Japan’s top-selling make of luxury automobiles. The GS models come in a V-6 sports sedan, a high-performance F sedan, and the hybrid model that I tested. Highway manners of the GS450h are impeccable, with an assist from the blind spot monitor to keep me out of trouble. Ride on the Dunlop 235/45R18 SP Sport Maxx radials (on 18” nine-split-spoke alloys) is silent and responsive, and the driver can select from four drive modes – Eco, Normal, Sport, and Sport+. In winter the driver can select “snow”, and there is an “EV” (all-electric) selection to made, too. Lots of options, and lots of performance in the Sport+ mode, especially so for a hybrid vehicle. While in Sport+, the car provides more shock damping, tighter steering, and improved throttle response. And all these handling and power characteristics are present in a car that delivered over 30 mpg for me all week. Official ratings are 29/city and 34/highway (31 overall). The M.S.R.P. of the GS450h is $58,950 (base), and options include a luxury package for $5,645, blind spot monitor for $500, premium Mark Levinson stereo for $1,380, hard-disk navigation setup for $1,735, and intuitive park assist for $500. Total list price with freight and some incidentals comes to $69,754. That luxury package includes heated and cooled, 18-way power front semi-aniline leather seats, heated bamboo and leather steering wheel, LED headlamps, and rear-door manual sunshades (an electric sunshade is present in the back window). The 835 watt stereo includes 17 speakers with 7.1 surround sound architecture. The screen for the navigation is gigantic, at 12.3”, with split-screen capability, and controlling its applications is done with a mouse on the console. 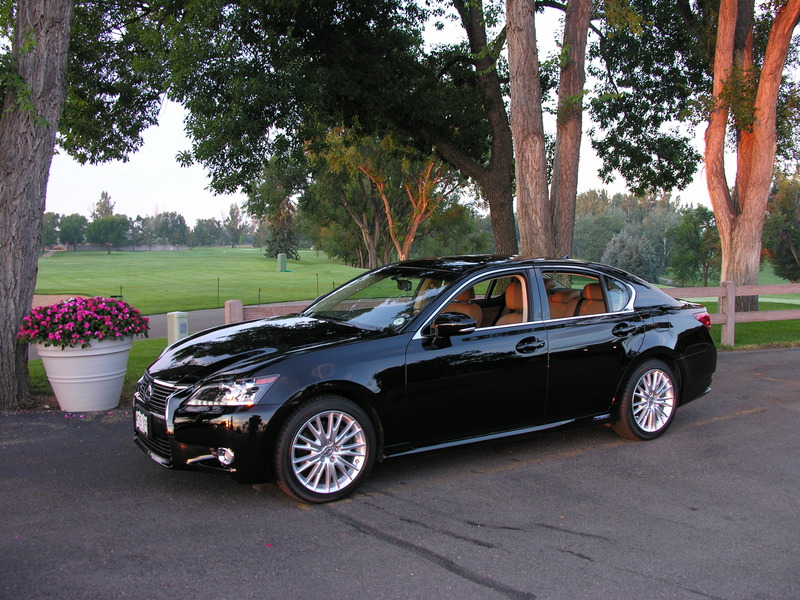 The GS450h came with Obsidian (black) paint and the interior was called “Flaxen”, which was a golden hue. The paint seemed to be two feet thick, and the styling excelled mostly up front. No tailpipe finishers were present at the rear, in somewhat of a curious styling move (hybrid?). But the car is an eye catcher, for sure. The saying goes, “you get what you pay for”, and for Lexus and the GS450h, the saying holds true to form. Lots of money, lots of car, and a satisfying test. The word “juke” has multiple meanings, but in sports parlance, to juke is to feign or fake out, as for instance a running back might do. I suppose that is what Nissan had in mind when naming the mini-crossover that they introduced in 2010. I had one last week to test, a 2012 “SV” all-wheel drive model that came in metallic bronze (dark brown). Nissan manufactures the Juke in their plant in Oppama, Japan, for the North American market. Sales figures for the Juke have exceeded the company’s expectations since inception and in June of this year sales were up 52.7% from the same month in 2011. The Juke is a five-passenger four-door sedan with interesting styling that resembles a frog on wheels. Parking lamp lenses poke up from the front fenders and into the driver’s view and look pretty cool after dark. The taillight lenses are visible in the mirrors, as well. No excuses for driving around at night with a light out in this car! Speaking of which, another two round headlights are located in the front fascia, rally-car style. The Juke has a two-door appearance with the rear door handles installed on the C-pillars, a Nissan custom. Room in the fold-down back seat for three is adequate for all but large adults, and trunk room is 11 cubic feet. The Juke styling puts somewhat of a restriction on both trunk space and rear seating capacity. M.S.R.P. of the Juke SV is $23,230, and optional floor mats and freight bring the total to $24,165. With the SV the owner gets a power moonroof, premium speakers, upgraded cloth seating, keyless entry, pushbutton starter, satellite radio, power windows (4), tilt/telescope, and I-CON. That last item is Nissan’s Integrated Control system, a dashboard display that provides control and observation of turbo boost, mileage data, climate settings, and, well, everything but navigation directions. The hand brake is on the console, which is painted like the outside of the car and shaped so that it resembles a motorcycle gas tank. The shifter is on there, and it controls a continuously variable automatic transmission. That is all you can get with all-wheel drive, and it is coupled to a 1.6 liter, four cylinder, turbocharged engine. Horsepower is 188 and torque is 177 lb. ft. It’s a good power plant, and the transmission is, shall we say, acceptable. I do like that it allows manual shifting, and that is what I employed on my trip to Vail. I didn’t care for the turbo lag, but it goes pretty good when spooled up. Mileage ratings are 25 city and 30 highway, and I averaged 29 mpg during the week. 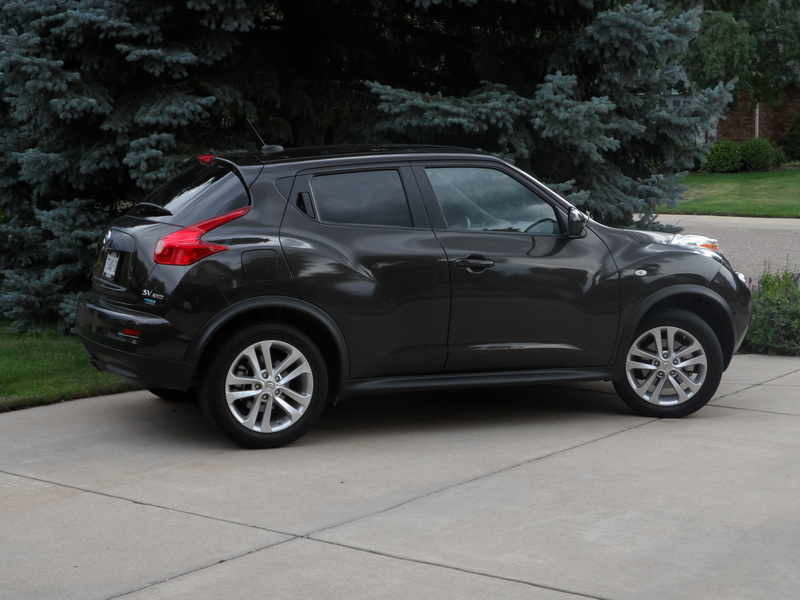 The Juke all-wheel drive system has torque-vectoring, a nice feature that splits torque up to 50/50 between the front and rear axles, plus it distributes torque from side to the side at the rear axle. All this makes the Juke handle great, as do the Goodyear Eagle RSA P215/55R17 high performance radials mounted on ten-spoke alloy wheels. Wheelbase of the 162” car is 99.6”, and the weight is 3,170 lb. Nissan figured the Juke would sell to male shoppers, but as it has turned out females dominate the purchases – Nissan is happy with the sales, period. I think the buyers are pretty happy, too.